Discover Burlington Ontario: Celebrating Robbie Burns Day with a 8km run! Celebrating Robbie Burns Day with a 8km run! The Burlington Runners Club is busy clearing the roads for the 31st Annual Robbie Burns birthday celebration 8km run through Burlington! 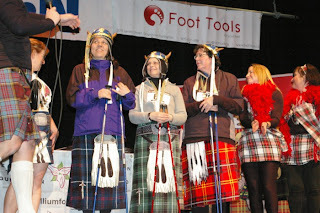 Featuring over 900 runners of all ages, including a couple over 80 years, wearing traditional Scottish outfits or some combination of sorts….what do you wear underneath those kilts when it is 20 below? The race will start (9:00 am) and finish at Central High School and wind its way through the downtown core. Thanks to the event sponsors, there are over $2,000 in gift certificates awarded to winners in six age categories, a best costume award and every finisher receives a certificate. So make sure you come on down and cheer the runners on as it is one of Burlngton’s most colourful, road race!